The Darlington family is among Edwardian Britain’s most revered, but underneath this façade of respectability hides secrets that could mean their ruin. Lord and Lady Darlington’s seat at Wentworth Hall is one of England’s oldest estates, but the servants have been whispering about the lack of hands (and funds) for the upkeep of the grand manor. Are the Darlingtons hoping to find 18-year-old Maggie a wealthy husband? Is that why newly moneyed Teddy Fitzhugh, whose father recently drowned in the sinking of the Titanic, has been invited to stay? His visit-and the complete change in Maggie’s personality since her return from a year abroad in France-gives the ever-curious staff even more reason to gossip than usual. When scandalous satires start appearing in the newspaper with details suspiciously similar to the goings on of Wentworth Hall, the Darlingtons are determined to keep their secrets to themselves and their affairs (both private and public) in order. And the first order of business is finding the culprit. But where to start? Downstairs among the staff? Or should the Darlingtons look even closer to home . . .
Because I LOVE historical fiction. And gossip. And secrets. And mysteries. I can't wait! Along the way, Persimmon undergoes the trials of love, heartbreak, doubt and the discovery of her own true value. And she does it with the aid of a tiny, brave creature named Epiphany. Ok, so I'm not really feeling that cover, but I DO like the sound of the story. Persimmon sounds fun with best friend potential. I also like how the story sounds like it will be heartwarming with a sweet romance (but, heartbreak? Oh no!) and adventure. Plus, who--or what--is this tiny, brave creature named Epiphany? I am curious. Ever feel blue when it comes to blogging? Ever wish you could network your blog more, gain more followers, get ARCs, or learn more about the ins and outs of YA book blogging? 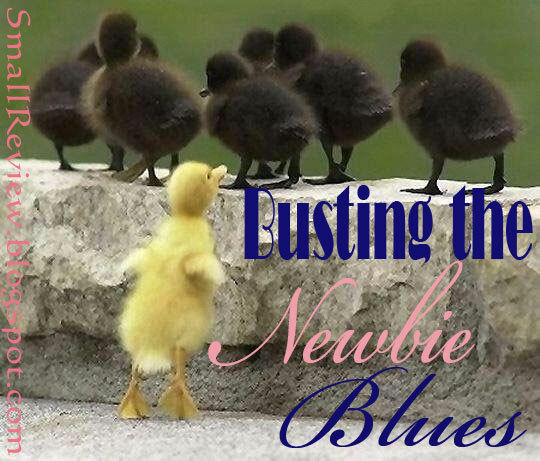 Check out Busting the Newbie Blues! 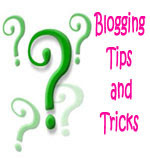 New bloggers ask their blogging questions, old bloggers help answer them! A casual event for the YA book blogging community. Are you an established blogger? 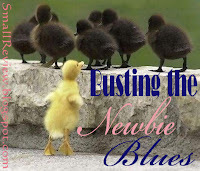 Come share you advice with newbies, or check out Ruby's Busting the Big Blogger Blues event! I really want to read both of these although I'm worried Wentworth Hall will be like the Luxe series, which I found to be populated with incredibly unlikable characters (I only read about half of the first before I DNFed due to hating everyone). I finished the first Luxe book, but I didn't bother reading further than that. I didn't like any of the characters either. Hopefully this book will have better characters, or at least more interesting gossip. Eeek - Totally drooling over Wentworth Hall. Do you want Downton Abbey. I'm obsessed with that show. I haven't started Downton Abbey yet, but EVERYONE is buzzing about it! I think one of these days I'm going to rent the dvds and have a marathon. Oh, Wentworth Hall sounds totally awesome. @_@. Wentworth Hall seems awesome!!! 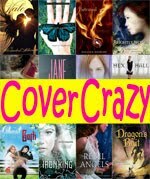 Added at my TBR! I hadn't heard of either, but I love the sound of both of them and am adding them to my TBR list. Especially Wentworth! I'm looking forward to reading Wentworth Hall. Thanks for sharing! I'm dying to read this, and not *just* because it features DARLINGtons. ;) Nice pick! Wentworth Hall is one of my WoW picks too! And I've been wanting to read The Three Loves of Persimmon for a long time now (but it's an Aussie read so I haven't managed to get ahold of it yet). Oh that's probably why I haven't heard of it before! I didn't realize it was an Aussie book. Thanks for the info! Both of these sound great! I'm not loving the cover of the second one either but the description sounds awesome! I want to read the Persimmon book definitely!! I like the cover!! Ooh, I'd never heard of Wentworth Hall before. It sounds a bit Jane Austen-y and who doesn't love that? 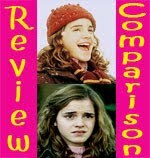 I love the cover too, although the middle girl reminds me a lot of Emma Watson. I'm totally looking forward to reading Wentworth Hall! Love, love, love Downton Abbey. The other book sounds interesting. Thanks for sharing! SO many people are in love with Downton Abbey. I really need to get moving with watching that series. I like the sound of both, but if I had to pick I would go with the first book because it sounds like Dowton Abbey. LOL and I love that kind of thing! 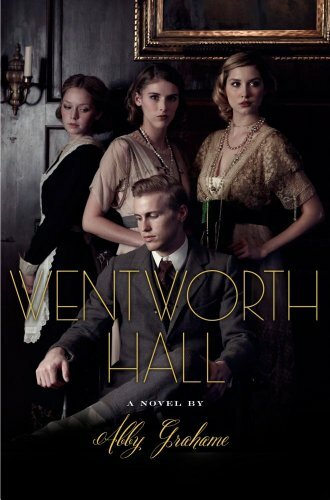 I have Wenworth Hall on preorder! I CANNOT wait for it. Only problem? I'm afraid of High Expectation Syndrome. 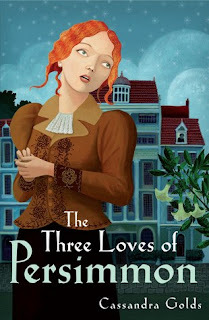 The Persimmon book is quite a gentle, character-focused story, it's a bit fairytale-esque, written in the style of, "and now, dear reader, what has Ephiphany been doing all this time". It's one of these books I'm glad that I borrowed from the library rather than bought - but that's my opinion, and other might disagree. Thank you so much for all that information! I do like books like that, but I definitely have to be in the right mood for them.